Bob Marley images on a wall of the Bob Marley Museum in Kingston, Jamaica. Destination Jamaica, the third largest island in the Caribbean Sea is situated west of Hispaniola and south of Cuba, about 870 km (540 mi) south east of Miami. Jamaica shares maritime borders with the Cayman Islands (UK), Colombia, Cuba, and Haiti. Nearby Caribbean island nations are Dominican Republic and Haiti on the island of Hispaniola, and Puerto Rico. 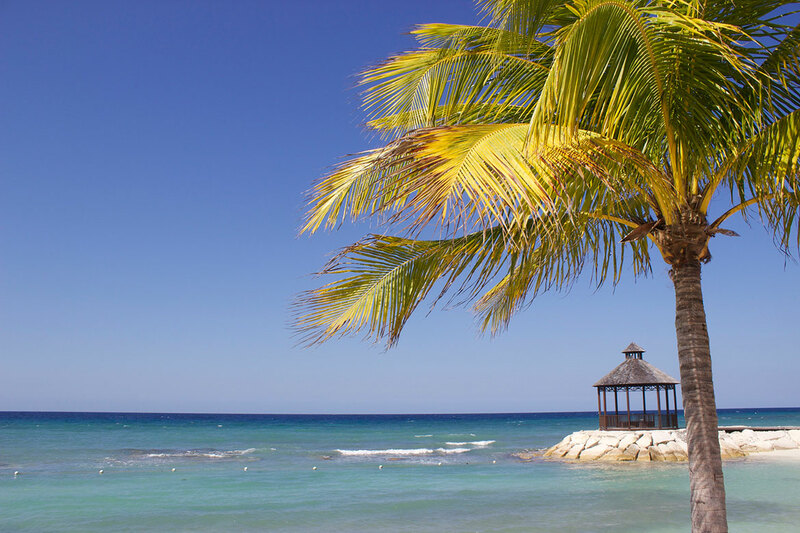 Jamaica's landscape is mostly mountainous, a limestone plateau covers two-thirds of the island, karst formations with caverns and caves dominate the island, it has narrow coastal plains, green dense rainforests and sandy bays and beaches. Highest point is Blue Mountain Peak (2,256 m) in the Blue Mountains National Park in the east of the island. Jamaica covers an area of 10,991 km², making it slightly larger than Cyprus, or slightly smaller than the U.S. state of Connecticut. The island has a population of 2.75 million people (2015). Capital and largest city is Kingston, other major cities are Spanish Town and Montego Bay. Official language is Jamaican English, mainly spoken is Jamaican Patois or Patwa, an English-based creole language with West African influences. 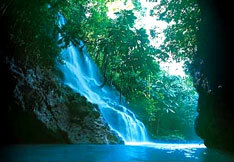 Jamaica is the third largest of the Caribbean islands, and the largest English-speaking island in the Caribbean Sea. In pre-columbian times Jamaica was inhabited by an estimated 60,000 Arawak Indians. In 1494 Christopher Columbus "discovered" the island and claimed it at once for the King and Queen of Spain. In 1517 first Africans brought to Jamaica by the Spaniards. The British arrived in 1655, defeated the Spaniards and claimed the island for the King of England. By the late 17th and early 18th centuries the island was virtually divided. Colonial planters and their slaves inhabited and worked in the costal plains, while high up in the Blue Mountains there lived fugitive slaves, the free community of the Maroons. More than 300 years later on August 6, 1962, Jamaica became an independent sovereign state and a member of the British Commonwealth of Nations. Montego Bay (pop. 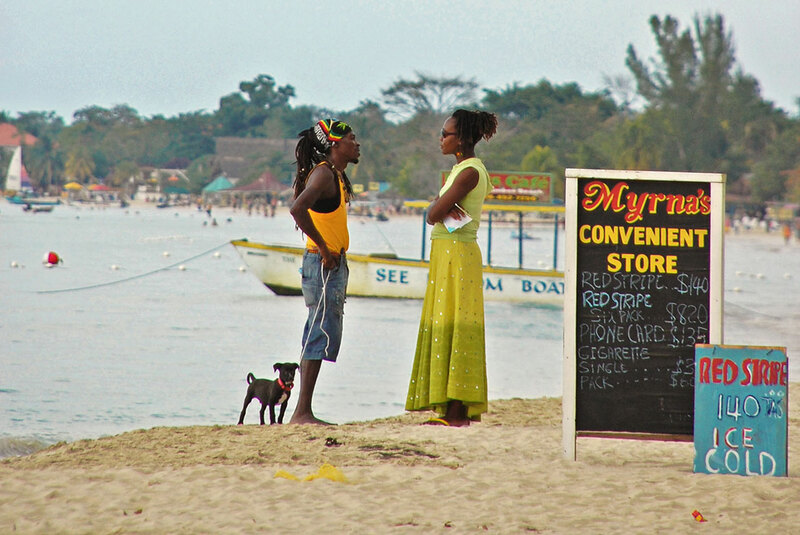 97 000), Negril. Independence: 6 August 1962 (from the UK). At Independence, Jamaica became a member of the Commonwealth, with Queen Elizabeth II as Head of State. The Queen is represented in Jamaica by the Governor-General. Location: Caribbean, island in the Caribbean Sea, south of Cuba. Terrain: Mountainous, less than one-fifth of the land is relatively flat. Climate: Jamaica's climate is tropical marine. The mountainous terrain, the north-east trade winds and land-sea breezes modify the climate. Ethnic Groups: multi-ethnic society, with blacks predominating - 90.9%, East Indian 1.3%, Chinese 0.2%, White 0.2%, mixed 7.3%, other 0.1%. Religions: Anglican, Baptist and other Protestant, Roman Catholic, Rastafarian, Jewish. Languages: English (official), most Jamaicans speak an English-based dialect which is known as patois. Agriculture products: Sugarcane, bananas, coffee, citrus, yams, vegetables, poultry, goats, milk, crustaceans, and mollusks. Industries: Tourism, bauxite/alumina, textiles, agro processing, wearing apparel, light manufactures, rum, cement, metal, paper, chemical products, telecommunications. King's House Jamaica, the King's House (formerly Somerset Pen) in Kingston is the official residence of the Governor-General of Jamaica. Jamaica is a constitutional parliamentary democracy and a Commonwealth realm. Chief of state is the British monarch, represented by the Governor-General, head of government is the Prime Minister of Jamaica. Website of the Cabinet Office of the Government of Jamaica. Information on Government policies, programmes and the activities. Official website of the ministry. Established as one of the first diplomatic missions at the time of Jamaica's emergence as an independent country - London. The official web site of Jamaica's Mission to the UN. 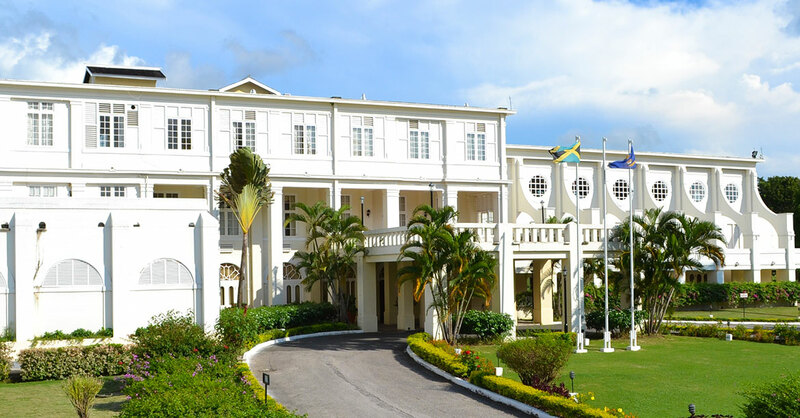 List of Jamaican Diplomatic Missions Abroad. Address list of Consular Missions in Jamaica. Statistics in the island of Jamaica. Key statistical data of Jamaica. main roads, railroads and major airports. Searchable map and satellite view of Jamaica. Searchable map and satellite view of Kingston, Jamaica's capital. Biggest national news paper offers Jamaica News and country information. Cultural, artistic and scientific organisation in Jamaica. A Jamaican online photo album by National Geographic. Jamaica's premier library for fostering and promoting the nation's knowledge of its history and heritage. The culture of Jamaica is a music culture. The Rhetoric of Reggae Music. Reggae @ it's best - Montego Bay. First Class Music from the Third World. 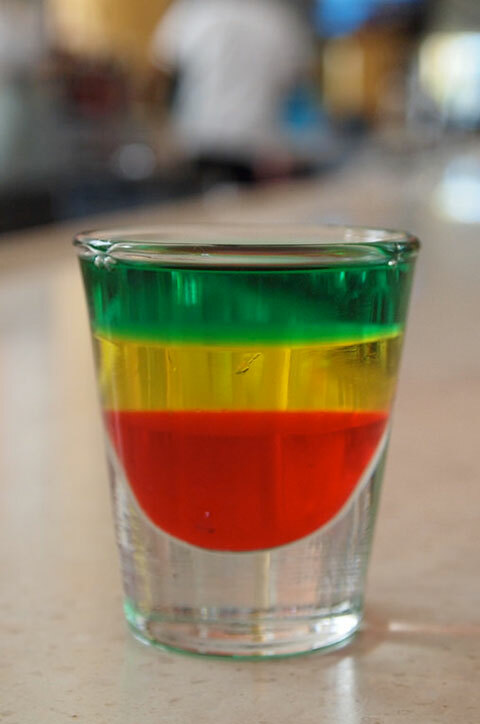 Bob Marley Shot. The Pan-African colors are red, gold, and green (inspired by the flag of Ethiopia). Jamaica has a mixed economic system that includes a variety of private freedom, combined with centralized economic planning and government regulation. Jamaica is a member of the Caribbean Community (CARICOM). Top industries are tourism; alumina, bauxite; agro-processing, and light manufactures. The central bank of Jamaica located in Kingston. The principal stock exchange of Jamaica. The world's second oldest spirit. The Coffee Industry Board of Jamaica. Processing of Jamaican sugar cane. Fly Jamaica Airways is an airline headquartered in Kingston, Jamaica, it operates flights from Norman Manley International Airport. Air Jamaica was Jamaica's National Airline. The airline ceased all operations in 2015. The Port authority of Jamaica. Looking into the Caribbean, Saint James, Montego Bay. Official Jamaica tourist information by the Jamaica Tourist Board. Kingston, Mandeville, Montego Bay and more. A site for information about tourism related topics in Jamaica. De web site on Jamaica, a portal dedicated to Jamaican arts and culture. Jamaica travel and tourism Information. A guide to Jamaica by the Association of Jamaica Attractions Ltd.
Montego Bay City visitors guide. 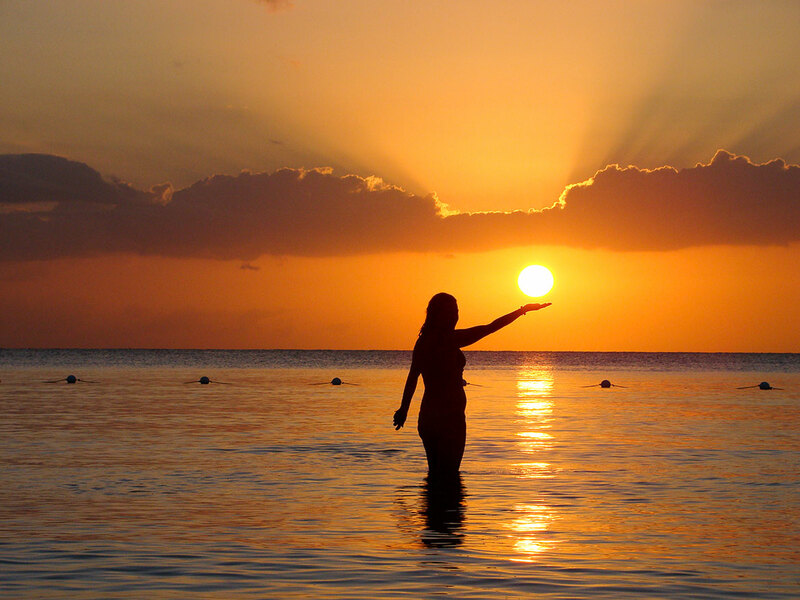 Catching the sun at Bloody Bay Negril. 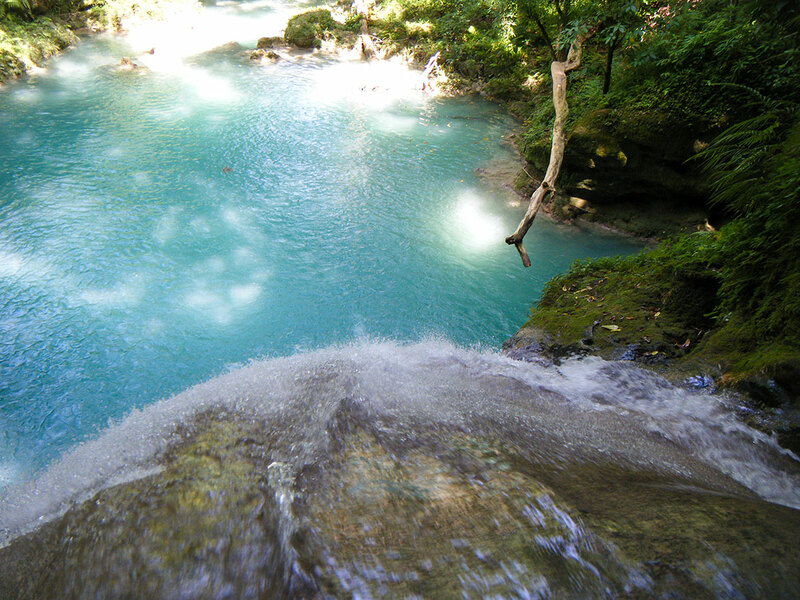 The Blue Hole near Ocho Rios is a popular spot for tourists and locals, has scenic tropical waterfalls. NEPA promotes Sustainable Development by ensuring protection of the environment and orderly development in Jamaica. Windsor Research Centre (WRC) created this website to share information about a globally unique landscape located in the heart of Jamaica. The Maroons, escaped ex-slaves who settled in the mountains of Jamaica, carved out a significant area of influence. Creativity and Resistance: Maroon Cultures in the Americas, Center for Folklife and Cultural Heritage. Page about the Jamaican Maroons. Article from L.G. Harris a former Colonel of the Moore Town Maroons. The woman who became one of Jamaica's founding "fathers"! Background history of the Rastafarian movement. Rastafari at a glance by BBC. An overview of Jamaica's history. The contemporary form of Patois. Patois Definitions, a Jamaican dictionary with Patois, Rasta and Reggae words - Walk Good!